When I came back from my first cruise, I literally felt like I was still on the cruise ship at times with its constant swaying. This lasted a few weeks after the cruise. I even woke up in the middle of the night from what I can only describe as my brain trying to connect with my shipless reality. Let’s face it, if we live our daily lives the same way we live when we on vacation, we’d all be in serious trouble. The symptoms of “vacation brain” exist within what I call a “cruise ship lifestyle.” Here are the ones that stand out most to me. The posts, Understanding the Symptoms of Vacation Brain and Are You Living a Cruise Ship Lifestyle? delve deeper into how this topic relates to the influence of culture and also discuss the application to our everyday lives. For this post, let’s discuss some ideas to remedy this unhealthy state of existence. The best remedy that I know of for “vacation brain” comes from Romans 12:2. We must stay keenly aware that vacation brain can easily become a part of our everyday lifestyles if we don’t deliberately choose to not let that happen. Consider the following for helping keep vacation brain from becoming a lifestyle. Renew. 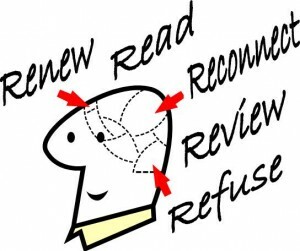 Renew the routines and habits that work well and discard or revamp what doesn’t. Read. I need to get as much positive input as possible, so I read God-focused blogs in addition to my Bible. Reading is one of the best ways to renew your thinking. Reconnect. While my husband and I connected a great deal on our cruise, I missed my friends and the rest of my family. Reconnecting help to refocus. Review. Review your priorities. Checking your calendar and your checkbook can help with doing this. Refuse. Vacations should be relaxing. They should help create new perspectives or reestablish old, helpful ones. Refuse to let the benefits of vacation be erased. Almost immediately upon our return from our first cruise vacation, we had to deal with some significant life issues. I found myself wondering if the relaxation of vacation would dissipate more quickly than it came. Then I realized that vacations don’t create a state of peace that will live on indefinitely; instead, they should hit a reset button that helps us re-balance in a way to better deal with life’s coming challenges. DISCUSSION: What other suggestions do you have for remedying vacation brain? Why do you think vacations are so important, maybe even crucially essential, for our lives? This entry was posted in Uncategorized and tagged balance, bible, challenge, connect, deliberate, family, focus, following, friends, fuse, habit, habits, health, important, new perspective, pattern, perspective, priorities, read, reconnect, refuse, relax, relaxation, renew, rest, review, routine, significant, spiritual, struggle, thoughts about balance, time, trouble, vacation brain, victory, work by admin. Bookmark the permalink. Vacations are important, if for nothing else, than to get me out of my routine. I need to disconnect from time that my almost daily bike ride doesn't offer since when I am done I am still here. I like not having to think about anything. I am taking a vacation in June and not even going to schedule posts on my blog so I will not be tempted to look and comment. I also do not foresee that syndrome, as I have no desire to do a cruise. Motion sickness does not equal a good time for me. All that side stuff being said: your 5 points are so important. Look forward to your posts next week. A year ago we were looking forward to our Vegas vacation. This year just seems hectic and frustrating. Even planning time off seems a hassle. I think my mind and body could use a break, but none is planned and every weekend is filled with activity. I miss the DOWN time when I didn't feel this way. I think I need a Mini vacation in my head, if not in my body, so I would love a little "vacation brain" right now….but I do know what you mean. Vacation is different, it gives you a break, if it is a good one you come back better able to deal with life, restored, refreshed. Then back to reality, even when you aren't ready for it. But God is always there, thankfully HE never goes on vacation! My family likes to always be looking forward to our next vacation. We try to have a week-long one twice a year and then small ones (camping, night away, etc.) periodically. What struck me is that many people seem to live like they are always on vacation; in other words, they lack deliberateness. This series of posts was difficult to write, and I'm not sure my point is very clear, but they helped me work through the frustration I feel living in this world. Anyway, I am praying for you, my friend. A vacation in your mind… I wonder how that might happen. One reason I run and bike is to get a break from life regularly. My mind is able to cruise and do whatever it wants, and it usually processes what I need to work through. Yes, thankfully God is always there, and we can always rely on Him. Keep putting one foot in front of the other. You'll be okay! I think time away from most things is helpful; especially items where you end up repeating day after day. It allows us to ask questions about how we are doing those day to day things. Are we going through the motions or do we really get engaged with what we have as responsibilities either in our jobs or in our relationships. Time away allows us to recharge not only our body but our mind as well. We do want to live life deliberate and we want to do our work that way too. It is good to take vacations of all sorts… day ones, week long, 15 minutes. It helps also to have some type of evaluation of what we are working on. We should ask if we are working on the right things and are we giving proper time to the things we value most. We should ask as well what are we communicating with the way we go about our work and the way we treat our relationships. The hope is that we are communicating that we value them and that we give them good effort and attention. As usual, your comments give more depth to the point I was trying to make. And really, you are emphasizing ways to be deliberate about life and how vacations can be a big part of staying consistent in our efforts. Great wisdom, Mark. Made me think and definitely can struggle with Vacation Brain Syndrome. I suggest instead of a vacation, go on a retreat. What is the difference? A retreat is a time of rest and reflection, whereas a vacation is not usually focused on rest but recreation. In lieu of time away, consider a time of reflection from a different perspective to gain fresh awareness and vision. Excellent point! Some of my family’s vacations are focused on recreation, and some are kind of a blend of the two. Haven’t really ever done a true retreat. I may need to sometime. We definitely need to make a point to set aside time for both types of R&R. I hope you had a great vacation even though you came home to what seems like a storm. I'll be praying for you. When I go on vacation I always remind myself the importance of being productive and focused before I go, so when I'm on vacation I can fully relax and not worry about "life" or work. I work hard so I can play hard:) Great thoughts. Thanks, Dan. We had a terrific vacation and are working through the \”storm\” with consistency, discipline & prayer. I do the same thing before I go on vacation. I try to have as much of my work done for the week I get back, knowing that my brain takes several days to get in gear again. Sure makes enjoying vacation LOTS easier. My mind can be on vacation a lot more quickly and therefore longer. Interesting thoughts on your vacation, Kari. I think vacations are important to get out of the regular routine of life – for both relaxation, refreshment, and also to see if there is anything in regular life that has to change. On my recent vacation I realized how much writing consumes my life. I slept better and longer on vacation even though I was sleeping in a tent – it helped me see I need to make some adjustments! I agree, Barb, Vacations break our routines and help us notice possible adjustments we need to make in addition to giving us concentrated time to relax and refresh. The problem, I think, comes when we either don't take the time for vacations and thus miss the perspective change, or we let our vacations be just as hectic, busy and stressful as our regular lives. So glad to hear your recent time away gave you some much needed rest along with some insights. One thing I try to do is to spend a day transitioning from vacation to work, just preparing myself to get back to the real world. And your words about getting back into your routine as quickly as possible are tremendously helpful – I find that works well for me. I like to have a cushion day as well. Helps a ton, especially when I worked outside of the home. Much easier to implement now, especially since I work from home. Actually, I've thought quite a lot about the anticipation factor not just for vacations but for most of life's events. I've thought about the role that expectation play a lot too. I've weaved these topics a bit into posts, but I am thinking of dedicating some post to them because they truly do play major roles in our lives. Related to vacations, I think that dread for "normal" life is all to obvious. I definitely saw it on the cruise where people did and spent what they wouldn't otherwise just as a way to forget about life.